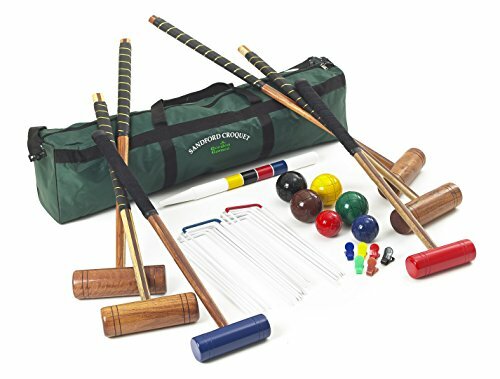 • Our Sandford Friends and Family croquet set has 2 full sized adult mallets, 2 mid-size and 2 smaller cheerfully painted children's mallets that are smaller, lighter and easy for a child to handle. • Having different sized mallets in one set is not uncommon - the real difference in this brilliant set is the balls!! • Four 12 oz wooden croquet balls and two 6 oz smaller balls (painted blue and red to match the smaller mallets). • This small change means that with the standard sized, powder coated steel hoops, everyone can enjoy a brilliant game of croquet. • Adult players can play their normal challenging game while the children have an easier run at the hoops, which are larger when compared to the smaller ball, making it a more fun game all round. • The Sandford Friends and Family set is of exceptional quality with value pricing. • Includes 6 mallets, 6 balls, 9 powder coated steel hoops, 6 clips, 2 winning posts and full rules! • 4 x Oval spliced wood shaft, hard wood head mallets, with a leather bound grip. • 2 x 37 1/2" and 2 x 34" long. • 2 x Wooden children's croquet mallets with Red and Blue painted heads and fabric grips for comfort at 31" long. • All packed in a zip fastening nylon bag, with shoulder strap for portability. A complete 6 player, 9 wicket set, for all your Friends and Family to savor! With 6 mallets, 3 different lengths (2 each at 37 ½", 34", 31"), and two ball sizes, all your friends and family will enjoy some friendly competition. Adult size mallets have hardwood heads and leather bound grips. While junior mallets have fabric grips for comfort. The 2 smaller balls provide children with an easier run at the full size steel hoops, which appear larger compared to the smaller balls. Designed in the UK by croquet enthusiasts for all ages and all skill level play.Stored in a heavy duty zippered nylon bag, with comfort shoulder strap for portability. Exceptional quality - with value pricing. Bring joy to all your family and friends.